Rakhi being an important festival of India is celebrated with great pomp and vigour all over the country. Feasting is the core essence of this grand festival. Traditional dishes such as gulab jamun, peda, malpua etc are cooked on this day. So, celebrate this special day by cooking some mouth-watering dishes. The articles assigned in this chapter provide detailed information about various palatable dishes that can be cooked on Raksha Bandhan. Raksha Bandhan is celebrated every year on a full moon day in the month of Shravan. This popular Indian festival is celebrated by tying a Rakhi thread around a brother';s wrist. Make the celebration grand with delicious dishes. Delight your dear sibling on this special day of Raksha Bandhan with mouth-watering dishes. This chapter includes articles that discuss about recipes of tasty dishes on this auspicious occasion. Raksha Bandhan means bond of protection. Tying a Rakhi thread around a brother';s wrist implies protection of a brother from all kinds of evil influences. 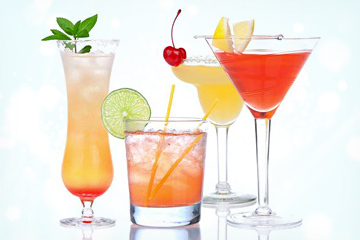 Refreshing and tasty drinks can bring joy and happiness to the celebration. Surprise your siblings with a glass of refreshing drink. This chapter includes articles that discuss about the celebration of Raksha Bandhan with deliciously refreshing drinks. Raksha Bandhan or Rakhi is a bond of protection. It is celebrated in India and all over the world with great vigour and gusto. Rakhi celebration is considered to be incomplete without mouth-watering dishes. Delicious starters can add joy and happiness to the celebration while bringing smile on the face of your siblings. This chapter includes articles that discuss about delectable starters on the special day of Raksha Bandhan. Raksha Bandhan celebrates the bond of love and sacred relation between brothers and sisters. It is celebrated with great enthusiasm in all over the world by tying a Rakhi thread around a brother';s wrist. Celebrate this festival of love, care and affection with delectable desserts. This chapter includes articles that discuss about the significance of sweets and various dessert recipes on this special day of Raksha Bandhan. Rakhi is a day which celebrates the wonderful bond between siblings, and you all must have celebrated it with much fervour every year. But what better than to please your brother or even sister with home made food for Rakhi, that your siblings like rather than going outside, even if it's simple dishes it makes the spread much more special. Sweets are very special when it comes to this occasion. Also you can send sweets as Rakhi gifts India with the help of this online gifting portal for Rakhi. Let us check out some recipes for Rakhi special sweet dishes which can be easily prepared at home. Vermicelli Kheer : Boil milk in a broad mouth pan, add the roasted Vermicelli, and sugar to taste. Let it boil till thick. Dissolve saffron in 1 tsp water. Add saffron and cardamom to the thick vermicelli and milk mixture. Garnish with soaked almonds and resins. Malpua : For the sugar syrup, put sugar and water in a saucepan and bring to boil. Simmer for 8-10 minutes till thick syrup is formed. Mix sifted flour, sugar and water to form smooth, medium thickness batter and keep aside for 30 min. Heat oil in a shallow flat bottomed pan. Carefully spread the mixture in the pan and fry till golden brown. Transfer the pancake into the sugar syrup. Serve hot garnished with cardamom, rosewater and fresh cream. Khoya Burfi : Boil milk reduce heat and let it simmer for 45-minutes to one hour till thick paste like. Keep stirring in between. Add sugar and coconut powder and stir till sugar dissolves. Grease a thali and pour the batter. Garnish with pistachios and almonds. Let it cool and cut into square or rhomboid pieces. 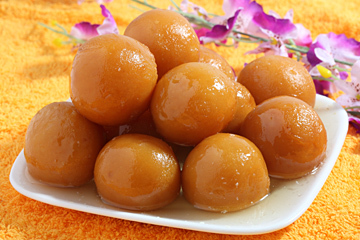 Gulab Jamun : Mix khoya and flour together,make the shape of gulab jamun. Make sugar syrup with sugar and water adding saffron to it. Deep fry gulab jamun and add it into syrup. Serve hot. Badam Ka Halwa : Soak almonds in hot water for ½ an hour. Peel off the skin. Grind to fine paste with milk in a blender. Soak saffron strands in 2 tbsp of warm milk. Take a non stick kadhai . Add 4 tbsp ghee and allow to heat. Now add almond paste and stir in low flame. Cook for 5 to 7 mins. Once it thickens, add remaining milk, saffron soaked in milk and stir well. Cook further for 3 to 4 mins or till it thickens in low flame. Now add sugar and cardamom powder. Stir continuously in low flame. The sugar dissolves and the mixture turns liquid. Continue stirring till the mixture thickens and attains halwa consistency. Add remaining ghee and mix well. Garnish with almond slices and saffron strands. Enjoy your Rakhi celebrations with these delicious sweet dishes. Now sending Rakhi to India from USA has never been this easy and hassle free owing to this online rakhi gifting store where you can avail to online Rakhis very easily with just a click of mouse. Keep visiting us ! The festival of Raksha Bandhan is the celebration of the love between siblings and preparations for this day starts many days in advance. There are various rituals that accompany this festival and they encompass many different spheres. Such customs include the choosing of special Rakhi threads by sisters for their dear brothers and some of them even opt for making these sacred threads. Other rituals are the preparation of the Rakhi thali with various items like roli, chawal and shagun nariyal. Another very important element that must be found on the Rakhi thali is a platter of delicious sweets. Such sweets are loved by both bro and sis and they can also be used as gifts to send Rakhi to India. Raksha Bandhan Special Sweets There are many special sweet dishes that are bought or made at home for this grand festival and only a few of them are being described here. A very popular sweet for this occasion is kaju katli which is made out of cashew nuts, milk and ghee. Sevai or vermicelli pudding made using milk, cardamom powder and saffron is also a customary dish for this festival. Another delicacy for this event is rasmalai that can be easily made using rasgullas, cardamom powder and milk. A platter of boondi laddoos made out of besan and ghee is quite inseparable from a festival like Raksha Bandhan. This festival will also remain incomplete without gujiyas that can be made using maida and khoya. The last sweet on our list is also the most irresistible one, that is, sweet and crunchy jalebis that is made of flour, rice flour, sugar and ghee. You can easily send a gift through Rakhi.giftstoindia24x7.com of sweets for your siblings in India from anywhere around the world on Rakhi. Many exclusive mithai hampers are available here on this reliable online Rakhi store for Raksha Bandhan. These hampers are a part of the Rakhi hampers that are available here on this online Rakhi portal. Rakhi Sweet Dishes The Kaju and Mewa Thali with Rakhi has two types of sweets arranged on a round steel thali. The sweets that can be found in this thali are kaju phool and mawa kalam and the hamper also contains a Rakhi along with roli and chawal. The Assorted Sweets Box with Rakhi contains four kinds of sweets that have been placed in a red and golden square box. The sweets here are kaju barfi, kaju roll, mawa kalam and mawa bati along with a Rakhi and two dabbis of roli and chawal. The Flavoured Barfi and Kaju Sweets Hamper with Rakhi consists of four varieties of sweets in a cane basket. The sweets available in this basket are chocolate barfi, mango barfi, kaju sev and kaju phool basket. The Yummilicious Sweets Hamper with Rakhi has two types of sweets on a blue and silver square handmade tray. The sweets that can be found on this tray are kaju puri and watermelon sweets and the hamper also contains a Rakhi along with roli and chawal. The Mixed Sweets Hamper with Rakhi contains three kinds of sweets that have been placed in a red heart shaped handmade tray. The sweets here are mango barfi, mixed dry fruits barfi and kaju sev along with a Rakhi and two dabbis of roli and chawal. The Kaju Phool, Chocolate and Bhaskar Barfi Hamper with Rakhi consists of three varieties of sweets. These sweets have been arranged in a red and golden octagonal handmade tray and these delectables are chocolate barfi, kaju phool basket and bhaskar barfi. These delicious sweets can be easily sent as Rakhi to India through this Rakhi site for your brothers and sisters. Many other kinds of sweets are available here along with a variety of other attractive gift ideas. These gifts along with unique Rakhi threads available on this online Rakhi store can be used for celebrating online Rakhi to India. Rakhi, one of the main festivals of India is celebrated by the siblings with pomp and enthusiasm. They keep waiting for the occasion to come. On this auspicious day, sisters keep fast and tie the sacred thread of Rakhi for the long life and good health of their brothers. They in return promises to protect their sisters from all evils of life. Most importantly sweets and gifts are exchanged to make the festival even more sweeter. When is Rakhi in 2018? Rakhi 2018 will be observed on 26th August. Now since you have already noted when is Rakhi, you can make a plan beforehand to make the day eventful. And if you are unable to visit home this year, by sending Rakhi to India, you can make your loving brother happy. You can take the assistance of online gifting portal, GiftstoIndia24x7.com, one of the most proficient site to send Rakhi to India. Through its efficient service, your Rakhi gifts to India will be delivered just at the time of the festivity. 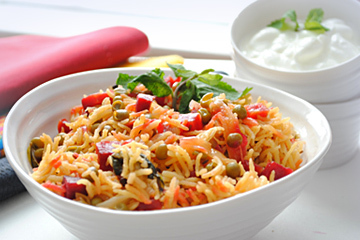 You can also prepare mouth-watering recipes at home to make the festival of Rakhi grand. You can follow these recipes and let your loved ones relish delicious food - Tamarind Rice Ingredients 3 cups of cooked rice with 1 tbsp butter/ghee/white oil 1/2 cup thick tamarind extract 3 tbsp channa dal 2 tbsp grated ginger 2 level tsp red chili powder 1 level tsp turmeric powder 1/4 tsp asafetida powder 6-8 green chilies slit in two 3-4 dry chilies Few curry leaves 5 tbsp cashew nuts (broken up and kept)- optional 1/2 cup vegetable oil salt to taste Method 1. Heat ½ cup vegetable oil. 2. When the oil is hot add the chana dal, dry chillies, curry leaves, green chillies, asafetida powder or a small piece of solid asafetida. 3. Fry until the dal is golden brown. 4. Now, add the salt, turmeric powder, chili powder, grated ginger, broken cashew nuts and stir for a few minutes on a low flame. Don't let the turmeric and chili powder burn. 5. Boil for 15-20 minutes till the quantity reduces to half and the mixture becomes thick. 6. 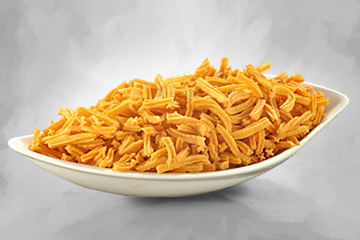 Put the cooked rice in a dish, add the prepared mixture and required quantity of the Tamarind extract. 7. Mix to the rice and stir well. Keep covered until ready to serve. Spicy Dal Ingredients: 1 1/2 cups moong dal 4 cups water 1 1/2 tsp. salt 3 tbs. butter or Ghee 1 tsp. cumin seeds 1 tsp. ground turmeric 1/2-inch stick cinnamon 1/4 tsp. cayenne pepper 1/4 tsp. ground ginger 1/4 tsp. ground coriander 1/2 tsp. mustard seeds 6 whole cloves How to make spicy moong dal : Wash the dal and boil in the salted water until it is all very soft and most of the water absorbed. Stir often. Heat the ghee or butter in a saucepan, and add the spices to it. Stir them around for a few minutes, then remove from the heat. Pour the dal into the butter and spices, being careful to protect yourself from the spattering which is likely to occur. Return to the heat, stirring often, and let it simmer until it has the consistency of a fairly thick sauce. Hence you can celebrate this festival not only by sending Rakhi to India but also preparing scrumptious food at home. Rakhi is one of the most important festivals, celebrated by all Indian siblings. Wearing new clothes, keeping fast and tying Rakhi thread while praying for the long life and prosperity of their brothers, are the main aspects of this festival. Brothers in return, vows to protect their sisters from all evils of life. Like all other festivals and occasions, gifts here also play a very important role to make this event joyous. Hence the time has to hop stores and shop for gifts. And if you are staying far from your loved ones, you can take the assistance of online gifting portal to send Rakhi to India. One amongst those is GiftstoIndia24x7.com, who has grabbed many’s attention owing to its proficient delivery system and dedicated customer care support, who has been assisting its customers since over a decade. Hence you can be rest assured that your Rakhi gifts to India will reach the recipient just on time. Sending Rakhi to India with this portal is just a cakewalk. Not only gifts, but the store also has also arranged a wide collection of Rakhi threads. Send Rakhi to India this year and make your loved ones treasure those memories for a long years to come. Now make a note that Rakhi 2018 will be observed on 26th August, if you are still wondering as to when is Rakhi 2018. You just need to browse through the Rakhi gifts section to check the articles arranged in the store. Not only by sending gifts, you can also prepare something special to make the Rakhi celebration eventful. Hence some of the dessert recipes are as follows - Malpua Recipe Ingredients: For Rabri: 1 liter Milk 1 cup Sugar For the Syrup: 1 cup Sugar 1 cup Water Saffron strands 1/2 tsp Cardamom Powder For the Malpua: 500 gms Flour /2 tsp Baking powder 400 gms Sweetened Condensed Milk Slivered almonds and pistachios to garnish Ghee How to make Malpua: Mix the milk and 1 cup of sugar in a thick-bottomed pan. Cook to reduce it to a fourth of its original volume while stirring frequently. Remove it from the fire; allow it to and then chill in the refrigerator. Mix equal quantity of sugar and water in a pan. Boil it until a single-thread consistency is obtained. Add cardamom powder, saffron threads, mix well. Keep it aside to use later. In a large mixing bowl, blend the condensed milk, flour and baking powder together to form a smooth batter. Meanwhile heat enough ghee in a deep frying pan to cook the malpuas. Pour the batter into the oil to form circles. Cook till golden brown. Remove from the oil and put directly into the sugar syrup. Remove after 2-3 minutes and drain on a wire rack. Now to serve, place 2 malpuas in a plate, spoon rabri over them and garnish with slivered nuts. Badam Katli Recipe Ingredients: 1 kg Almonds 900 gm Sugar 1/4 cup Boiled Milk How to make Badam Katli: Soak almonds in water for 12 hours. Drain and change the water of almonds. Peel them and keep aside. Add little milk and grind it finely. Mix ground badam and sugar in a large skillet. Cook this mixture, stirring constantly. Make a thick paste. Make a roti of the thick mixture when cool. Now cut it into pieces. Almond Katli is ready to serve. Hence make this Rakhi memorable by trying these recipes at home. Your loved ones will definitely relish these sweets. Rakhi, one of the main festivals of India, is celebrated with lots of pomp and show while following various customs. On the day of Rakhi, siblings take an early bath to start their day with. Wearing new clothes, sisters tie the sacred thread of Rakhi on the right wrist of their brothers followed by other customs. It is known to all that no occasion is complete without gifts, hence your nearest shops and stores wear the new color of gifts and other articles. To make the festival of Rakhi 2013, you need to plan for the occasion much in advance. Rakhi 2018 will be observed on 26th August, as per the Gregorian calendar. GiftstoIndia24x7.com, one of the most popular e-gifting sites has arranged a wide collection of gifts no matter what the occasion is. Now since you know when is Rakhi 2018, you can visit this online portal to have a look at the gifts arranged under different categories. Through this proficient portal, your Rakhi to India will reach the recipient just at the time of the festivity. Not only gifts, this store also has arranged a wide myriad of Rakhi threads ranging from Zardoshi Rakhi, Pearl Rakhi, Bhaiya-Bhabhi Rakhi and so on. Send Rakhi to India to your kid brother from the Kids Rakhi section and make his day momentous. . Since gifts, meeting with relatives and friends, wearing new clothes and grand dining are the indispensable part of Rakhi celebration, apart from sending Rakhi to India, you can try to prepare some delicious dishes at home to give your loved ones a wonderful treat. Let us discuss about the main dishes you can prepare at home on the occasion of Rakhi - Masala Poori (Main Course) Ingredients: 1 cup wheat flour water for kneading Salt to taste ¼ tsp ajwain 1 pinch asafoetida ½ tsp red chili powder 2 cups of oil to fry Method: Sieve the wheat flour and salt together in a bowl Add the salt, ajwain, asafoetida and red chili powder into the bowl and knead the dough well using water Keep the dough a bit firm by regulating the amount of water you use carefully Keep the kneaded dough aside for half an hour after covering it with a lid. Heat oil in a kadai that to frying Take small portions of the dough and make circular balls out of it Using a rolling pin, roll these balls into small circular pooris. Once the oil is hot enough, gently slide the rolled dough into the kadai and fry it well Serve hot with the Shahi Paneer Korma Shahi Paneer Korma (Main Course) Ingredients: 1 medium-sized onion 1 cup of tomato puree 250 grams paneer 2 teaspoons ginger and garlic paste 1 teaspoon of red chilli powder, turmeric powder, coriander powder each 2 teaspoons garam masala powder ½ cup of water ½ cup of milk salt to taste Method: Shallow fry the cubed paneer till it becomes light brown in color. Remove from heat and keep aside In a separate pan, heat some oil and add the cumin seeds. After 3 seconds, add the grated onion and cook that till it turns brown. Add the ginger garlic paste and cook for another minute till the paste too gets cooked. Add the tomato puree next along with the salt, coriander powder, turmeric powder and chilli powder Allow the spices and tomato puree to cook for a minute while stirring occasionally Add water and bring to a boil Pour the milk next along with the fried paneer cubes and reduce the heat to allow the dish to simmer for another 3 minutes. Serve hot. These dishes will definitely be relished by your relatives and guests. Thus by sending gifts and giving them wonderful treats, you can make their day truly memorable.